It took four nights and three riding days in Vail to get the opportunity to experience Snooze in Denver. In between was mac ‘n cheese at the pub called “The George,” that mid-mountain hot dog at the “Hot Dawg Haus,” this bowl of chili from “The Red Lion,” and all the other carb-heavy treasures found in such density as ski resort villages such as Vail’s. Enter our last meal before boarding the plane back to LA. We made an early morning departure from Vail to Denver – the drive back in to the metropolis and airport hub from the ski town at which we stayed for the past 4 nights. We were destined to eat well without the LA cost. And no longer true was the direct correlation between money spent and quality food eaten so often found in ski towns. The interior of Snooze is evocative of an updated 1960’s diner. Oval tables with orbiting benches line the center of the dining space. Its bustling energy employs eco-friendly mores and consistently tasty dishes, with a twist. 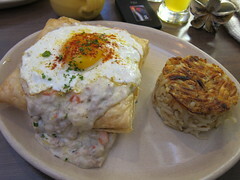 I very much enjoyed my Breakfast Pot Pie, which advantageously didn’t even have a pot. The square crust that surrounded it was golden, buttery flakyness all around. The filling did its job, with the warm sausage gravy providing a savory and satisfying center to which the flaky crust collapsed. 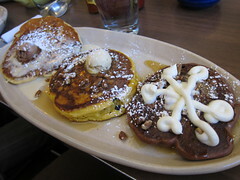 Probably most glaring on the menu for sweets lovers is the variety of pancakes and house-made custom butters and syrups in which they are dressed. But don’t be fooled by a la carte, lone pancake ($4.50) – it’s humongous. My breakfast companions who ordered the pancakes were overwhelmed and couldn’t very well finish the sweet flapjacks. Maybe the Red Velvet with cream cheese frosting and praline syrup; the Sweet Potato topped with homemade caramel, pecans and ginger butter; the Graceland with bananas, peanut butter and bacon caramel sauce all require a bigger, sweeter mojo. 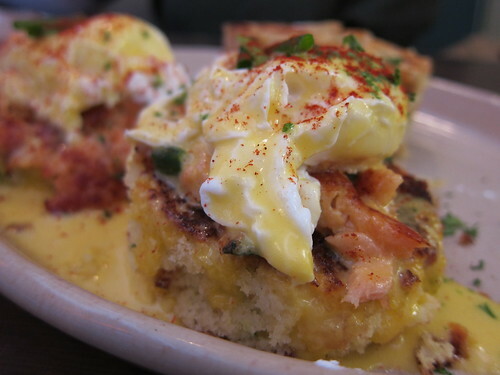 The benedicts were solid, though, with perfectly poached eggs being no small detail, nor was the fresh salmon in particularly the Upstream Benny. This was another score for the savory selections at Snooze. We appreciated that our server was honest with what exactly on the menu wasn’t her favorite when we asked for a recommendation, indicative that this is an establishment whereby actually thinking about your food is encouraged. And don’t forget the variety of mimosas, available with St. Germain elderflower liqueur, and bloody marys, available with an extra-spicy, tequila (Maria) and gin option. They average around $6, which is quite a steal – especially for the Angeleno buck. And now, I’m intrigued by what other eats Denver has to offer. Alas, maybe my fellow snow sliders and I will have time to do a more thorough pass-through on our next trip. Aspen, anyone? This entry was posted in beer, cocktails, Food and tagged benedict, bloody mary, breakfast, brunch, Colorado, Denver, diner, eco-friendly, eggs, mimosa, pancakes, recycling, Snooze. Bookmark the permalink.